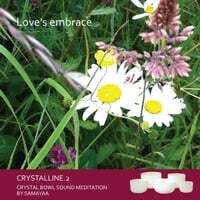 Samayaa plays crystal bowls for meditation and relaxation. Dive yourself in the magical overtones and harmonies of crystal bowls sounds. Love's Embrace - A crystal bowl meditation. A different way to relax within yourself...through sounds, harmony and silence. You can use this music to dive inside yourself, to rest, to relax, to meditate and to travel inside. You can relax in harmony, together with the sounds of the crystal bowls.